• The University at Buffalo women's basketball team will open up their 2018-19 regular season on Sunday evening on the road against Maryland Eastern Shore. This marks the second straight season the two sides have played with UB downing the Hawks 76-41 last season inside Alumni Arena. • For the first time in school history, the Bulls received votes in the AP Top-25 Poll and the USA Today Coaches Top-25 Poll, notching three votes in each. UB closed out the 2017-18 season ranked No. 21 in the country in the final AP poll. • Buffalo collected a pair of victories over ranked opponents in the 2018 NCAA Tournament as they downed South Florida and Florida State to advance to their first-ever Sweet 16.
including a perfect 12-0 record inside Alumni Arena. • Buffalo was picked as the preseason favorite to win the MAC East by the MAC coaches and Cierra Dillard and Summer Hemphill earned a spot on the All-MAC East preseason squad. Dillard was also tabbed as the Big 4 Player of the Year while Hemphill earned a spot on the All-Big 4 first team and Autumn Jones earned a spot on the All-Big 4 second team. • The University at Buffalo women's basketball team opened up their 2018-19 campaign on Novemeber 1 with an impressive 94-53 victory over division II foe, Bloomsburg. • All 15 UB players scored in the victory as senior Cierra Dillard led the way with 27 points, seven assists, six rebounds and three steals. • The Buffalo bench produced in a major way against Bloomsburg as they outscored the Huskies bench 56-14 behind strong games from Brittany Morrison (14 points) and Oceane Kounkou (12 points). • As a team, the Bulls shot 46.3% from the floor while holding the Huskies to just 34.0% shooting. The Bulls dominated the paint as they outscored Bloomsburg 52-20 while also outscoring the visitors in the fast break, 22-4. • The UB defense had a strong showing against the Eagles as they forced 24 turnovers and turned those opportunities into 27 points. The Bulls also notched 20 steals in the win. • Coming off of a historic 2017-18 campaign, the University at Buffalo women's basketball team will open up the 2018-19 campaign on Sunday, November 11 on the road at Maryland Eastern Shore. • The Hawks opened up their 2018-19 regular season on Tuesday night at East Carolina and were handed a 84-69 loss. Keyera Eaton led the way for the Hawks with 20 points, seven rebounds, two steals and two assists while Ciani Byrom netted 19 points, six assists and five rebounds. • The Shore was tabbed to finish in fifth place in the MEAC preseason poll with one first-place vote. • Maryland Eastern Shore returns their top three scorers from a season ago while Ciani Byrom was selected as a second team All-MEAC performer and Bairesha Gill-Miles was picked as a third team All-MEAC performer in the preseason. • Byrom led the Hawks in scoring last season as she averaged 11.1 points, 3.1 assists and 2.6 rebounds across an average of 30.0 minutes/game. • Gill-Miles was solid for the Hawks last season as she averaged 10.2 points, a team-high 7.6 rebounds and 1.3 steals while shooting 45.4% from the floor. • After becoming the cinderella story of the 2018 NCAA Tournament and finishing the season ranked No. 21 in the nation, the national media rewarded the Bulls with three votes in the 2018-19 preseason AP poll and three votes in the USA Today Coaches Poll. • This marks the first time in school history that the Bulls earned preseason AP poll votes and USA Today Coaches poll votes as they enter the season as MAC East favorites once again. • The Bulls earned their AP votes from ESPN Analyst and former WNBA star Rebecca Lobo who pegged the Bulls as No. 24 in the nation, and Carl Adamec from the Journal Inquirer who tabbed UB as No. 25. • Rebecca Lobo is familiar with the Bulls and head coach Felisha Legette-Jack as she was the analyst for the Bulls Sweet 16 matchup with South Carolina last season in Albany, NY. • After a strong first season with the Bulls, senior guard Cierra Dillard was selected by local media and athletic communication offices as the Preseason Big 4 Player of the Year. • Dillard was also one of three unanimous First Team All-Big 4 respresentatives. • Joining Dillard on the First Team is junior forward Summer Hemphill. • Earning a spot on the Second Team All-Big 4 was senior guard Autumn Jones who played a vital bench role for the Bulls a season ago. • The Bulls have had some success in their regular seasons openers since joining division I in 1991-92 as they own a 18-9 record in the first game of the season. • Since head coach Felisha Legette-Jack took over the program in 2012-13, the Bulls own a 4-2 mark including winning three straight season openers. • Buffalo handed Delaware the 87-73 loss last season inside Alumni Arena. • The last time Buffalo opened their regular season on the road was in 2013 when they defeated Binghamton 65-47. • The Bulls were tough to beat when they scored 80+ points a season ago as they posted a 15-2 record when doing so. • Overall, Buffalo scored 70+ points in 28 of their 35 games including doing so in 19 of their 21 games against MAC opponents. • The wins continue to pile up for the Bulls under head coach Felisha Legette-Jack as they produced their third straight 20+ win campaign last season, setting a school record with 29 victories. The Bulls surpassed the previous school record which was 23 wins in 1996. • This marks the second time in school history the Bulls have won 20+ games in three straight seasons dating back to their first three seasons in Division I (1994-97). • The 29 victories for the Bulls last season are the third most in MAC history behind Bowling Green in 2007 (31) and in 2014 (30). • The Bulls also were able to go undefeated at home (12-0) while also tying the school record with 10 road victories and six neutral site wins. • Buffalo posted 21 victories a season ago by double-digits including each of their final nine wins of the season. They also posted 14 victories by 20+ points including a season-high 38 point victory, 80-42, over Kent State on February 7, 2018. • UB also dominated MAC opponents a season ago as they defeated conference opponents by an average of 16.6 points while advancing to the MAC Championship game. • The Bulls finished the 2017-18 campaign ranked third in the nation in total steals with 422, with only Lamar University (511) and Saint Francis (431) tallying more. • Additionally, Buffalo finished with 15 or more steals in 14 different contests last season, garnering them the fourth spot in the nation in steals per game with an average of 12.1 steals per game. • Leading the Bulls' pickpocketing efforts last season was senior Cierra Dillard, who finished the year ranked 14th in the nation and 2nd in the MAC in steals per game, averaging 3.0 steals per contest. Dillard's stealing prowess allowed her to take the ball away from opponents a total of 105 times, good for 10th in the nation as she led the MAC in that category. • Dillard also broke the school record for steals in a season (105), a record that stood since 1991-92. • Also showcasing the ability to take the ball away was Junior forward Summer Hemphill, who tallied a total of 56 steals in her sophomore campaign, including a season-best five steals in four different games, including the Sweet 16 showdown against No. 2 South Carolina. • Hemphill finished the season averaging 1.6 steals/game, good for third-best on the team. • Senior Cierra Dillard begins her final season in a Buffalo uniform with 1,349 career points across her stops with UMass and the Bulls. She finished off her first season in a UB jersey leading the squad with 566 points which ranked fourth in school history for points in a single season. • The Rochester, NY native earned preseason praise by the MAC coaches as she was selected for the All-MAC East team for the first time in her Buffalo career. • She returns to the Bulls this season as one of two returning players in the NCAA to average at least 16.0 points, 5.0 assists, 4.0 rebounds and 3.0 steals per game a season ago. • Dillard finished off her junior season averaging a team-high 16.2 points, 5.2 assists, 4.1 rebounds and 3.0 steals while starting all 35 games and playing an average of 31.5 minutes/game. • During her dynamic run in the NCAA Tournament, the ultra competitive guard averaged 29.0 points, 5.3 rebounds, 4.3 assists and 3.3 steals while shooting 49.1% from the floor and 37.5% from behind the arc. • Dillard finished the season ranked second in the MAC and 14th in the NCAA averaging 3.0 steals/game. • She closed out her impressive junior campaign producing at least one steal in 33 of 35 games and recorded multiple steals in 27 games. She also set a career-high with seven thefts in a win over Toledo (1/20/18). • The crafty passer recorded at least one assist in all 35 games while recording 5+ helpers 21 times a season ago. She also led the team in assists 15 times during her junior season. • Dillard led the Bulls in scoring a team-high 19 times while going over the 20-point plateau a team-high 11 times. The Bulls owned a 9-2 record when Dillard scored 20+ points. • Senior shooting guard Autumn Jones returns to the Bulls after her successful first season in a Buffalo jersey that saw her score an average of 6.7 points/game while coming off the bench. • Jones turned into one of the streakiest bench players in the country a season ago as she was able to drain 45 triples on the year. • The Indianapolis, IN native scored in double figures 12 times last season including a career-high 18 points at Akron (12/30). •Prior to the NCAA Tournament, Jones scored in double figures in seven of the Bulls eight games including netting 13 points off the bench in the MAC Championship game vs. Central Michigan. • Jones also ranked fourth on the team with 42 steals a season ago while averaging 16.0 minutes/game. • With the departure of the Bulls all-time leader in assists, Stephanie Reid, UB will be searching for a replacement at the point guard spot and they might not have to look any further than sophomore Hanna Hall. • Hall returns for her second year with the Bulls and looks poised to take over the starting duties after earning the start in UB's exhibition against Bloomsburg. • The Hamilton, ON native played 20 minutes against the Huskies and finished with three points and four assists as the Bulls ran away with the 41-point victory. • Hall gained knowledge and experience last season sitting behind Reid as she appeared in 24 games and started two. She averaged just 1.9 points and 1.2 assists per game but her confidence andf presence on the court grew as the season moved on. • After graduating five players including three starters from last seasons Sweet 16 squad, the Bulls will be relying heavily on a seven-player recruiting class. • The highly-touted recruiting class includes four post players and three guards with three players coming from across the border in Canada. • The three guards that will be pushing for playing time are sisters Aireal and FIness Dickson and Oceane Kounkou. FIness Dickson will be a redshirt freshman after playing last season at Memphis before sustaining a season-ending injury. • The four post players that will be looking to replace last years starting center Cassie Oursler are Adebola Adeyeye, Keowa Walters, Alexis Adams and Zena Elias. • The Bulls had an outstanding year in defending opposing offenses from behind the arc in 2017, as they held opponents to just 26.5% shooting from deep. The mark ranked first in the MAC and fourth in the NCAA. • Buffalo held 12 opponents to 20% or worse from behind the arc last season which was the most in the NCAA. Villanova and Northern Iowa held 11 opponents to 20% or worse. • In the NCAA Tournament, the Bulls were able to hold two national ranked opponents to 20% or worse shooting from behind the arc. The Bulls held #3 Florida State to just 12.0% from distance in the win before holding #2 South Carolina to 20.0% from behind the arc in the Sweet 16. • As a team, the Bulls allowed just 5.3 made three-pointers per game last season on an average of 19.9 three point attempts. • Buffalo held 17 opponents to five made three pointers or less last season including nine of their last 15 opponents. • The Bulls turned into one of the best teams in the open court last season as they were able to outscore their opponents 399-123 in the fast break scoring category. • Last season, the Bulls won the fast break scoring category in 30 of their 35 games and finished the season winning the category in 18 of their last 19 games of the season. • Buffalo was able to hold nine opponents a season ago to no fast break points while recording at least two fast break points in every game themselves. • The Bulls scored in double figures in the fast break category 20 times last season. • Over the past two seasons, the Bulls have won or tied the fast break category in 59 of their 66 games including in 48 of their 51 wins. • One of the keys to success for the Bulls over the past couple of seasons under head coach Felisha Legette-Jack has been shooting a better percentage from the floor than their opponents. • Buffalo was able to shoot a higher percentage from the floor in 24 games a season ago and they went 24-0 in those games. • Over the past three seasons, Buffalo owns a 57-2 record when they shoot a higher percentage froim the floor than their opponent. • When the Bulls shot a lower percentage of the floor last season they held a losing record of 5-6 in those games. • Legette-Jack's goal for the team is to keep their opponent under 60 points as UB is 30-0 when doing so across the past two seasons. • Over the last three seasons, UB is 65-8 when holding their opponents to under 70 points and 30-0 when holding opponents to 59 points or less. • After the graudation of the winningest class in the Bulls division I history, Buffalo will be relying on a new group of captains to lead the squad this season. • After a team vote, the Bulls named Courtney Wilkins, Cierra Dillard and Ayoleka Sodade as team captains. • The trio of seniors have been a part of three straight 20+ win seasons. • Seniors Ayoleka Sodade and Brittany Morrison have made a major impact on the Buffalo program since they arrived in 2015 as they have combined for 71 wins over three seasons including two NCAA Tournament appearances and advancing to the MAC semifinals all three years. • Redshirt senior Courtney WIlkins has been around for the most wins on the roster as she has seen 90 Buffalo victories since joining the Bulls prior to the 2014-15 campaign from Australia. 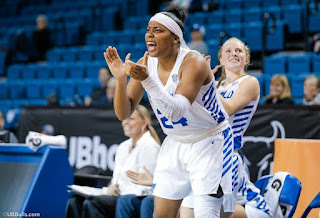 • The offense under head coach Felisha Legette-Jack has always been predicated on sharing the ball and making the extra pass and it resulted in the best season in school history last season. • Buffalo closed out last season ranked second in the MAC and 11th in the NCAA as they averaged 18.1 assists/game. The Bulls 633 total assists last season also ranked first in the MAC and 11th in the NCAA. • Last season, UB notched at least 20 assists in 11 games while also racking up 15 helpers in 30 of their 35 games overall. • Buffalo graduated their all-time leader in assists, Stephanie Reid, but return Cierra Dillard who ranked second on the team averaging 5.2 assists/game. • In a win over UNLV last season, the Bulls were able to set a Division I program record with 28 assists on 29 made field goals (assisting on 97% of FG's). • One of the keys to the Bulls success last season was their relentless work on the glass. • Buffalo owned a 21-0 record when winning the rebounding battle a season ago. • As a team, the Bulls averaged 41.7 rebounds/game which ranked third in the MAC and 31st in the NCAA a season ago. • In MAC games, the Bulls led the conference averaging 44.8 rebounds/game while going 16-2 against MAC foes.